Before we were ever talking to the folks at Bar-S about reviewing some of their products, we were buying them. We're a family that's all about value --- the products we buy had better fit our budget AND taste good. So we were already aware that Bar-S fit our lifestyle in this way. With grilling season nearing, however, I knew that there was an opportunity to try out some of their products that we hadn't had yet, and I'm so glad that we did! Here is what we thought of our recent sampling of Bar-S in our family meals. Grilling is not something I do well. In fact, I'll spare you the photos of my Bar-S Classic Franks, as they got a little bit "well done." Don't worry.. they still tasted delicious, and as long as I turn the "dark" side down in the kids' buns, they don't know the difference, and eat every bite! These hot dogs grilled up nicely (I like that they sweat a bit and get plump as they are just about done.) With the typical treatment of ketchup and mustard, they went over very well at my house! Something that maybe I shouldn't be so "frank" about (sorry for the bad pun), is how much we love bacon. I am known for batch-cooking bacon -- frying up pounds at a time for storage in my freezer. This makes it easy to get some out, warm it up, and put it into recipes: creamy potato soups, cheddar and bacon biscuits, and of course, breakfast burritos! Bar-S has an assortment of bacons available for a reasonable price every time I shop my local grocer, so I don't have to worry about going home without bacon due to it being out of my budget. My fave is the thick-cut -- it's awesome tossed into the kettle of baked beans that we put on the grill each time we cook out! (It's perfect camping bacon, too!) And if you're at all worried about salt, their low-sodium bacon is some of the best that I've tried! Here is one of my family's favorite meals using Bar-S products. We cut up some of the Smoked Sausage and put it into my homemade Red Beans and Rice recipe. With fresh garlic and lots of cracked black pepper, this is something that never lasts long (no leftovers!) You can also toss a few of these on the grill when you have your next BBQ. They make a mean chili dog. Wanna Win? We have a giveaway of our own for you to join! 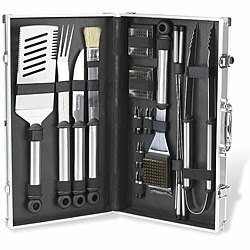 One lucky reader will get a Stainless Steel 20-piece Master Grill Set, and our runners up will get $5 gift certificates good for FREE Bar-S products! To be entered to win, just let us know which Bar-S product you want to try! You have until May 31st at 11:59 am CST to get your entries in. One entry per person, please! *Samples of Bar-S products were provided in order to facilitate this review. I would like to try their thick cut bacon. that's easy! a corn dog! I would like to try the classic smoked sausage. I would like to try the Bar-S Cheese Franks please , my son loves cheese franks. My family are meat eaters. We love all of BAR S, but I have not tried thier smoked sausage. I have a wonderful Kibosa, potato, & greenbeen dish this would be wonderful for. would love to try the polish smoked sausages. sounds delicious! I would love to try the Bar-S Classic Smoked Sausage. Thanks so much. I want to try the polish smoked sausages. I think I've only had the hot dogs, but I would like to try the corn dogs! I'd like to try their Black Forest Ham. We eat a lot of hot dogs. Love them. But I'd like to try the Hot Links. It would be only me since no one else in the family can handle the heat. I would like to try the Bar-S Chicken Jumbo Franks. I would like to try their low sodium bacon. Everything sounds so good; I'd love to try their polish smoked sausage. Thank you! I would love to try the Cheese Corn Dogs... never had anything of that nature! I would love some hot links! I would like to try the thick cut bacon because bacon makes everything better. The Thick cut bacon sounds tasty. I would love to try the Bar-S cheese dogs too! With some chili! By the way, I heard a Bar-S coupon will be in this Sunday's newspaper (May 16th) $1 off any 2 packages of Franks or Bologna, so make sure you try out your favorite Bar-S product and Save Big, I loveee coupons. I would try the Turkey Hot Dogs Bar-S Turkey Franks 12 oz. I would love to try their Bar-S Classic Bacon. I want to try Bar-S Cheese Corn Dogs :) *Thanks* for the giveaway! I'd like to try the Classic Corn Dogs. I would love to try the ham steaks for an easy supper! I'd like to try their turkey bacon. I love the Bar-S Ham Steaks! I would like to try their smoked sausage and hot links! I would try the smoked sausage. I would like to try the Bar-S Cheese Smoked Sausage. I would like to try the smoked sausage! I heard they have corndogs... and I heard they're great. I also see someone else's comment about smoked sausages and I love smoked sausages. Can I choose two? I would like to try Bar-S Classic Corn Dogs. There is not many Bar S products that I haven't tried and liked so I will say polish sausage. I would like to try the Beef Dogs! What a wonderful addition Bar-S Cheese Smoked Sausages would be to our camp out this summer...hot off the camp fire! I have never tried their thick cut bacon would love to try it ! I want to try the Bar-S corn dogs with cheese, since they told me about it. I usually put cheese on my corn dogs, anyway, lol. Didn't know they came that way, already! :) I am a fan of Bar-S on Facebook. Just send me a message that way, if I win. Mine is the baby face that says "Choose Life." I'd like to try the turkey corn dogs. I'd like to try the turkey corn dogs, I had no idea they had those! I would love to try the corn dogs! Yum!! Thanks! I'd love to try the polish sausage. We already love the smoked. The CHEESE CORN DOGS sound good. Thanks. I'd like to try their turkey and beef corn dogs. It would have to be the Hot Links for me. Mmmm ~ all the bacon, for sure! We'd love to win this! Great review. Thank you for the opportunity. The Polish Smoked Sausage sounds good. The Bar-S Thick Bacon is my pick. I'd like to try the low sodium bacon. Thanks! My husband is crazy about Corn Dogs and I'd also love to try their NEW (cold cut) Products: especially the Deli Shaved Oven Roast Turkey and the Deli Shaved Black Forest Ham. I would like to try the cheese franks. I want to try the Bar-S Honey Ham Steak 1lb. I'd love to try their classic corn dogs. I would like to try the Classic Corn Dogs! I'd like to try the Bar-S Turkey Corn Dogs. For sure the Classic Corndogs! Yum! The smoked sausage and the turkey franks are what I'd love to try. Would love to try their turkey corn dogs! I would like to try the low sodium bacon. I'd love to try the Bar-S Polish Skinless Smoked Sausage. Bar-S Cheese Franks sound yummy! I want to try their classic smoked sausage. The Deli Style Corn Dogs sound so Good! I would love to try their classic corn dog! I want to try their corn dogs, our grandkids love corn dogs! I would like to try their deli style corn dogs. I would like to try their classic franks! I'd like to try the classic smoked sausage. I wanna try the Beef Corn Dogs. the black Forrest ham would be great to try! I would like to try their Deli Style Corn Dogs! Cheese Smoked Sausage sounds great! I love their bolgna and hot dogs. I can't wait to try the Ham Steaks! The hot dogs are good, but would like to try how the corn dogs taste! I owuld like to try the Bar-S Classic Chopped Ham 1 lb. I love their hot dogs and bologna! i'd like to try the corndogs though! Hands down. The Hot smoked sausages. The ultimate summer grilling food with steamed peppers and onions and whole grain mustard! Would try the smoked sausage. I'd like to try the corn dogs. My daughter loves them too. I've actually never tried their corn dogs & would love to! I want to try their corn dogs. This is sad that I have not tried them as of yet as I live less than two miles from the local plant. Definitely the smoked sausage! I haven't had sausage in forever and it reminds me of my childhood days! I would love to try their smoked sausage and would put that grilling set to some serious use. Ever since I started doing the game on the Bar S site, I want to try the hot dogs! The sizzle noise and how they look on that grill makes me hungry!! I would love to try their smoked sausage because your red beans and rice in that picture look delish! I would love to try your corndogs. Thank You for the chance! Bar-S Honey Ham Steak - that's dinner made easy right there! I always buy their chicken dogs, but I would love to try their beef dogs! I would love to try the Bar-S Classic Hot Links! I would love to try their fully cooked bacon - yummy! We have tried most of the Bar S products as they are popular at our house, but we have not tried the corn dogs yet, so we would love to try those! The thick cut bacon looks yummy but all Bar S products are great! This pregnant mama would love to try the corn dogs!! I'd like to try the CLASSIC CORN DOGS..yum! I would love to try their bacon, we love bacon! I'd love to try the oven roasted turkey breast or chicken dogs! Would love to try the corn dogs! Bar-S cheese smoked sausge looks good. I'd like to try the Bar-S Beef Franks. I would love to try to smoked sausage. There is nothing better than a grilled hot dog! I'll take it! Smoked sausage would be fun to try! I would like to try Bar-S Smoked Sausage, thanks for the giveaway! I would love to try the smoked sausage. Smoked Sausage and bbq sauce is awesome. I would love to try their thick cut bacon. I thought I had tried everything!! I didn't even know they had thick cut bacon! That is next to try for me!! my little guy loves cheesy hot dogs so I would have to say the Bar S Cheese Franks- or the corndogs. Bacon is always good too. I did not know that they carried corn dogs, my girls love them!! I would like to try them!! I would like to try their smoked sausage. I would love to try the Thick-Cut bacon!! I see their hot dogs in the grocery store all the time but have never tried them. Maybe it's time I did. We make quite a few sandwiches for lunches around here, so I'd love to try the Bar-S Deli Shaved Ham lunchmeat. Their hot dogs are very good!